Zippered, pleated, weather-resistant pocket EXPANDS TO 8 X 6 X 4 INCHES to hold smartphone, keys, money, wallet, inhaler, ID, Credit Cards and other essential items you want to take with you. Fully adjustable to ACCOMMODATE WAIST SIZES OF 24 TO 42 inches. Made from Spandex with a BOUNCE-FREE DESIGN to eliminate movement. 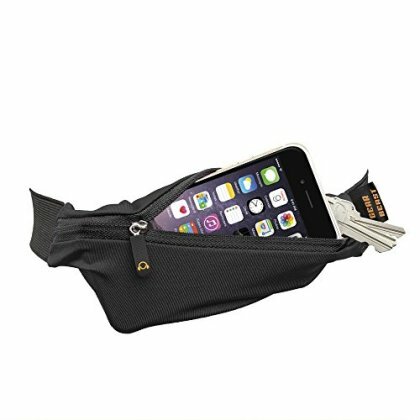 Perfect for running, hiking, jogging, walking, cycling, working out, travelling or any activity where you need to keep your hands free. COMFORTABLE soft elastic waist belt prevents chaffing while sturdy buckle and glides provide stability for the most active users. Accommodates the latest smartphones including iPhone 7 Plus, 7, 6s Plus, iPhone 6 Plus, iPhone 6s, iPhone 6, iPhone SE, Galaxy S7, Galaxy S7 Edge, Galaxy S6, Galaxy S6 Edge, Galaxy S6 Edge Plus, Galaxy Note 7, 5, 4 and All Other Phones less than 8 X 6 inches, even when using bulkier cases from Otterbox, Lifeproof, Supcase, Urban Armor , Etc.